This program calulates group velocity dispersion (GVD) in a laser cavity containing lasing medium (titanium doped sapphire crystal) and dispersion compensation optics (intra-cavity prism pair). Using this program, user is able to compensate positive dispersion in the lasing crystal by optimizing prism-pair parameters like material, separation and amount of prism-glass inserted into the beam. 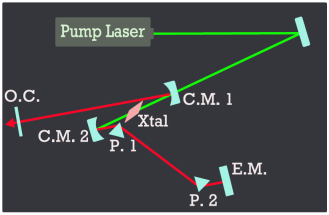 Lp (mm) Total pathlength pulse propagates through prism material in one roundtrip (4 passes).